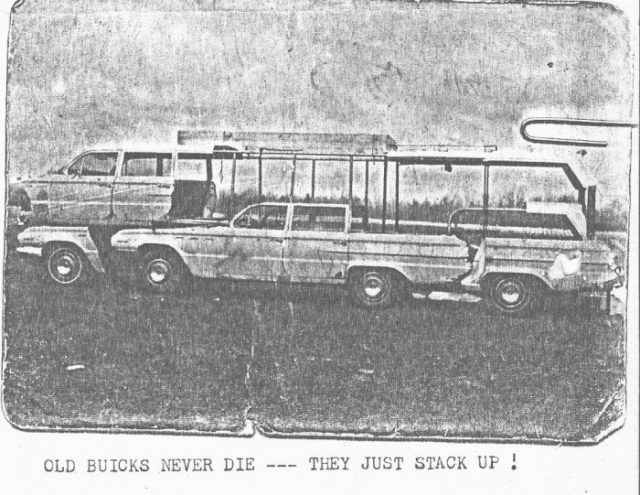 The amazing innovation of converting two 1962 Buick station wagons into one large functional motorhome is not something you see every day. Considering the regulations around what can and can’t be modified in the United States of America, the possibility of seeing one today would be highly unlikely, however back in the day people apparently had more freedom, at least in the way they could modify their homes or vehicles. 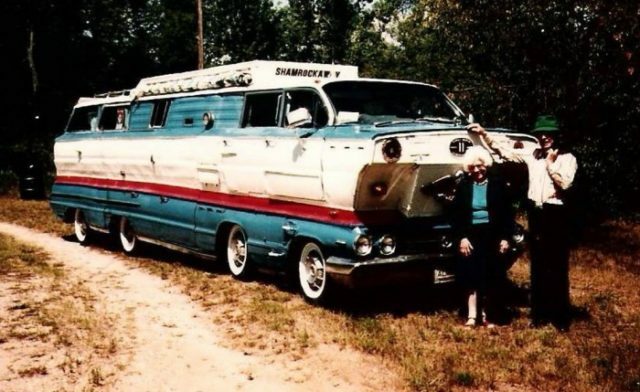 The motorhome in question is amazingly built, stitching together two Buick wagons to a point where its hard to see them anywhere in the amalgamation. The first thought that comes to mind is one of awe and mystery, how on earth someone can build such a wild rig, and why not just purchase a regular motorhome, instead of going to the lengths of painstakingly molding together two separate vehicles? J. Dennis McGuire of Alma, Michigan, a pioneer RVer, is the name behind this amazing feat, and had already converted several buses before starting on this project. McGuire had a special place in his heart for the Buicks, and always wanted to experiment with this amazing vehicle of its time. The third axle on the vehicle is the one which drives the 9960-lb rig. 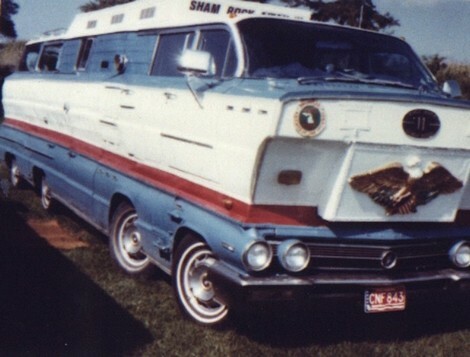 The converted motorhome was dubbed by McGuire as ShamRockAway and was one of many projects that McGuire undertook after his retirement. Whenever his family and friends inquired about his strange hobby his reply was short and to the point, ‘why not’. McGuire always had the mind of a mechanical genius and had been an active inventor and motorhome enthusiast since the late 40’s. McGuire’s very first project as recalled by his daughter, Colleen, had to be the 1942 school bus that he meticulously converted into a camper. 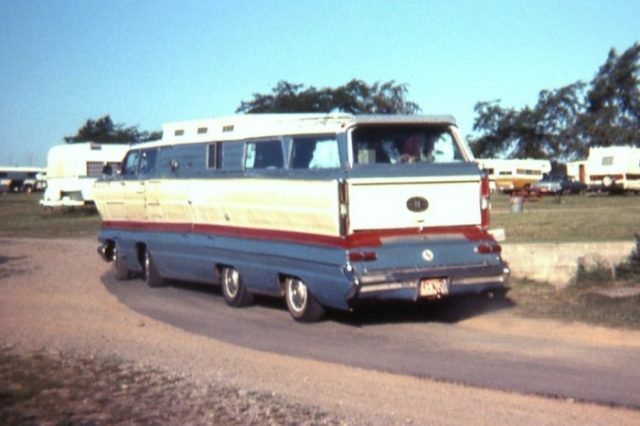 Later McGuire experiment with a 1958 Flexile coach, and then in the 60’s he toured the United States in his converted vehicle along with his family. Other projects under McGuire include a wind machine that efficiently generated electricity and was mounted on top of his house, and a semi-electric car. McGuire’s romance with the Buicks never faded away since he drove his first. He always appreciated and loved the smoother ride thanks to the coil springs on a Buick automobile, and he wanted the same level of comfort in his motorhome. He always appreciated and loved the smoother ride thanks to the coil springs on a Buick automobile, and he wanted the same level of comfort in his motorhome, hence his decision. One amazing feature on the ShamRockAway was an especially designed steering gear box that allowed all of the four front wheels to turn, providing perfect control on the road. The steering of the vehicle was power steering, it had air shocks on the drive wheels, equal curb weight on each wheel, power plant from McGuire’s favourite Electra 225 Buick, Dynaflow transmission, 401 cubic inch displacement v8 engine, two gas tanks, eight wheels, two heaters, solid frames, weight 9960 lbs, two air conditioners, and a double core radiator. There was a small cabinet inside the doors to hold booklets and maps. The bathroom area was enlarged with a special folding door that was added. The stowage and kitchen area were molded together into existing space to provide ample room to walk between the driving compartment and living room. The driver, however, had to sit on the engine, but all the measures were put in place so that the driver seat was safe and didn’t get hot on long drives. McGuire said that everyone who saw him building his motorhome, or after he had finished, laughed at him and made bets that he would never be able to drive this weird looking motorhome anywhere. Some even speculated that McGuire could not get the licensing and safety regulations from the authorities. However, McGuire’s take on the skepticism was that ‘if we didn’t have the doubters, there wouldn’t be any inventors in this country’.